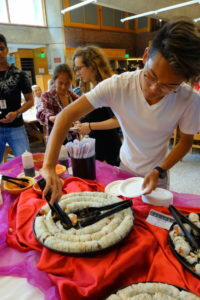 A part of International Day that a lot of students look forward to is the food: indeed, the regular Dining Hall lunch is replaced by numerous stands offering foods from many different countries. The stands are usually outside, but this year because of uncertain weather they were indoors; no worries, the food was just as good! Students who poured in after the international talent show Assembly had a wide range of options: Latin American, Mediterranean, Greek, Asian, a dessert buffet, a drinks buffet and much else. Of course, I could not eat all of the dishes there, but tried a bit of the Greek one, the Asian one and a few desserts. All of them were very tasty, especially the edamame dumplings, despite not being completely authentic (if you went to China, they would probably be different). The “brigadeiros”, for example, were very good but quite sweet and chocolatey: a Brazilian friend of mine pointed out that they usually taste less rich. This is an example of the “Americanization” of the food. International Day is a very original idea that requires a lot of organization and effort, including for the food. Despite being a little Americanized, the food was very good and it was a memorable experience where friends met over a delicious meal.